Corey O’Connor was elected to represent City Council District 5 and was sworn in on January 3, 2012. Endorsed by both the Post-Gazette and the Tribune Review, O’Connor won his seat with 75% of the vote. He also received endorsements from the Allegheny County Democratic Committee, the Allegheny County Central Labor Council, Young Democrats of Allegheny County, and Steel City Stonewall Democrats. Before running for City Council, O’Connor began a career in public service as a Community Development Representative for U.S. Representative Mike Doyle in the Congressman’s Pittsburgh District Office. Corey’s areas of responsibility included: business development projects, housing concerns, appropriations, EPA compliance, public safety, and FEMA disaster responses. He also assisted residents with foreclosures during the 2008-2009 recession and provided guidance to low income constituents regarding energy and heating assistance. In his four plus years in this position, Corey frequently represented Rep. Doyle at community meetings and public events. A life-long Democrat, he served on the Platform Committee at the 2012 Democratic convention. 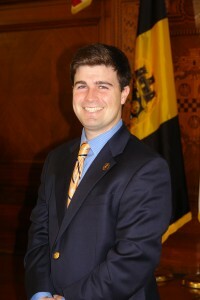 The notable website “Politics PA” named O’Connor one of Pennsylvania’s top “30 Under 30” and in 2010, he was selected as Allegheny County Young Democrat of the Year. As councilman, O’Connor is proud to have been behind many legislation endeavors such as: establishing an HIV/AIDS Commission; working cooperatively to create an Assessment Appeal Assistance Program; sponsoring legislation to end parking meter enforcement after 6 PM; and launching “Corey’s Crew,” a group consisting of volunteers who troubleshoot, clean lots, help senior citizens, and assist at community events. As Chair of City Council’s Committee on Urban Recreation, O’Connor has toured almost every city park and visited dozens of Recreation and Senior Centers. A graduate of Central Catholic High School, Corey became the youngest varsity sport coach in the history of the WPIAL at age 20. He earned his Bachelors Degree in Elementary Education from Duquesne University. The Councilman was a Squirrel Hill Little League baseball coach for ten years and was twice honored as Coach of the Year. A regular participant with the city’s Redd Up Team, O’Connor also serves on several boards and commissions, including the Allegheny County Sanitary Authority (ALCOSAN), Children’s Home of Pittsburgh, Lemieux Family Center, Holocaust Center, First Tee of Pittsburgh, VisitPgh, and the Cancer Caring Center. Corey, now 31, is the youngest of Pittsburgh’s late Mayor Bob O’Connor and Judy O’Connor’s three children. He and his wife, Katie Stohlberg O’Connor, reside in Swisshelm Park. The O’Connor family honors Bob O’Connor’s legacy of public service by hosting the annual “Bob O’Connor Cookie Cruise” that raises funding for local charities.